LOS ANGELES (JTA) — What lights the Festival of Lights? What really ignites the eight days, turning them into a hot winter glow? Is it the oil, the candles, the songs, the latkes, the gifts? What would you give for an answer? It’s dark and I am walking to Canter’s, a famous Los Angeles delicatessen, to buy a half-dozen bagels. I see by the blue and white cookies in their bakery window that it’s Chanukah. Near the entrance, seated on a crate, is a guy who appears to be homeless. Is this his home? As I pass he holds out a paper cup and shakes it. Coins jingle. “Any spare change?” he asks. It’s an exchange that happens daily in big cities and small, at the Mobil station, outside the Piggly Wiggly, in the mall parking lot, outside the restaurant. No matter where or how high up you live, it happens. It’s happened to me in Beverly Hills. The question is always same: “Do you have any change?” Yet our responses vary. At Chanukah time or anytime — on the street, at your door, in the mail or online — there are many ways you can respond to requests for tzedakah. Maimonides, the influential 12th century Jewish philosopher, wrote that there are “eight degrees of tzedakah, each higher than the next.” That is, eight distinct, clarifying ways you can respond to human need. The degrees are like steps progressively rising; kind of an early stairway to heaven. Proverbs tell us that a “mitzvah is a lamp.” On Chanukah we can light up the nights with giving. Consider each step of the tzedakah stairway a candle that is lit each night; each light is an act of giving tzedakah, of doing justice in the world. The lowest level is giving like a Grinch, too little and with a cheapster attitude, as when a panhandler is in your face and you feel put out. “Do I look like a sucker?” you wonder. “Isn’t there an agency for this?” you think. So you flip him a dime. How much is too little? Hey, this isn’t a seasonal piece on tipping but on doing justice. Do you need an accountant to paint you a picture? The third step is giving as much as is needed, but waiting until someone asks. A tough standard, as most of us don’t give until we are approached. The idea here is to cut down on the humiliation for the asker. Today, when institutions do much of the asking, the concept updates to what if Jewish Big Brothers Big Sisters has to ask X number of times in letters or e-mail before we respond? Each letter costs, ultimately diminishing your contribution. The fourth step flips the third: Giving as much as is needed before being asked. Think about it. This puts the giver on the lookout for tzedakah opportunities. It gets you twittering with finds and on the street, taking note of Jewish social service storefronts. People put their entire energies into looking for investments, why not tzedakah? Isn’t breaking the poverty cycle the best investment? This uneven equation allows for corporate boasting about its contributions: Remember those ads that ran after Katrina? Still, it’s tzedakah. Sixth step: The recipient is known to the giver, the giver is unknown to the recipient. Harvey Kornblum Jewish Food Pantry in St. Louis, where “confidentiality is strictly enforced,” illustrate this concept. As a giver, you know the items are going to someone in need, but they never know you. No. 7: Anonymous giving and receiving. Anonymity is a tough sell today; we are trained from birth to put our names on everything. Historically, in the Temple in Jerusalem there was a darkened room, called “lishkat chasha’im,” literally a “chamber of secrets,” where the giver could leave money and the poor would receive it without shame. 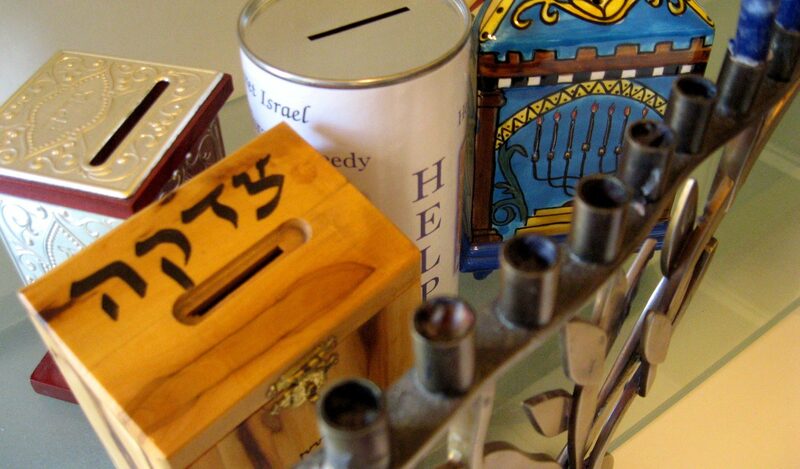 A tzedakah box, or pushke, is a related idea. Pick up a box from your favorite Jewish charity, or make one yourself, and join the righteous ranks of the famous unknown. The highest level, “exceeded by none,” Maimonides tells us, is self-sufficiency as a result of outright gifts, loans, partnerships or “finding employment.” At a time when every dollar for the poor is debated, Maimonides reminds us to “strengthen” the poor. In many cities, Jewish free loan societies, Jewish vocational service agencies and international agencies such as ORT help move people toward self-sufficiency. Handicraft workshops for the needy elderly and disabled such as Yad LaKashish in Jerusalem, beautifully keep this concept alive.